A primary school teacher in south-east China has been suspended after he was accused of discriminating against a student with cancer. 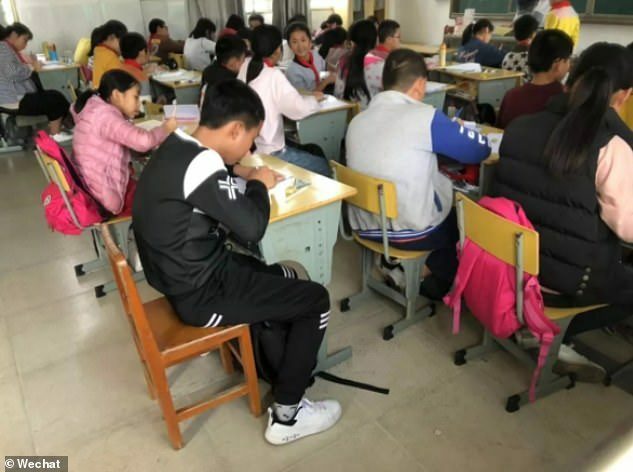 13-year-old Xiaozhou, who was diagnosed with Non-Hodgkin lymphoma, was made to sit apart from his classmates and was not allowed to take exams as the teacher thought he was contagious, Chinese media reported. The boy had recently transferred to Liancheng Primary School in Quanzhou, Fujian to be closer to his parents while recovering from chemotherapy treatment. 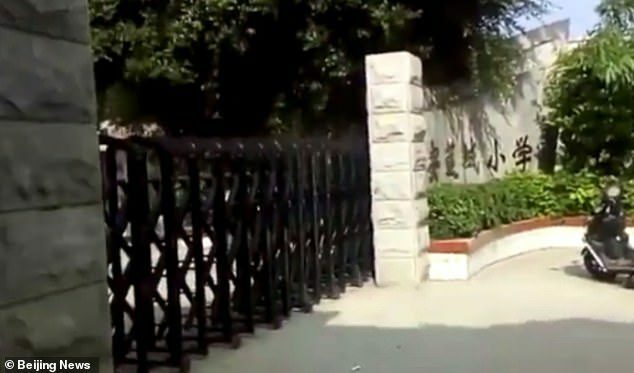 The boy’s father, Zhou Xiongying, first made the allegations on social media after Xiaozhou explained why he didn’t receive a mark for a midterm examination, according to Strait News. 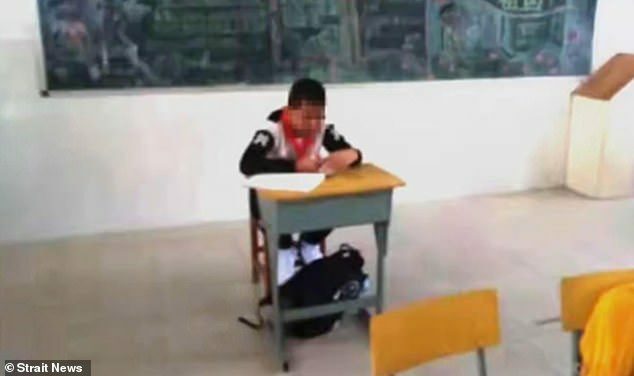 The student said the teacher, also surnamed Zhou, forbid him to sit with other pupils in the class or take exams, thinking he might be contagious. Xiaozhou had missed three exams already, according to the report. Videos and images posted on social media show the boy sitting at a desk some distance behind the rest of the class. ‘Can you imagine what was going through my son’s mind during the 45-minute exam? He’s forced to sit there like a fool. How sad must he have been?’ Zhou was quoted as saying. The father added that his son never mentioned anything to him because he didn’t want his family to worry. Zhou mentioned that shortly after his son had transferred to the school, the majority of the students did not show up for class. Non-Hodgkin lymphoma is a type of cancer that develops in the lymphatic system, a network of vessels and glands spread throughout the body. Zhou was diagnosed with the disease a year ago, but after chemotherapy treatment, he was given a clean bill of health by his doctor. The teacher, who also held the position of vice-principal, had been suspended, according to a statement released by Fujian Huian Education Ministry. ‘The Hui’an County Education Bureau recently learned about the unfair treatment of a student in Liancheng Primary School and immediately launched an investigation. Zhou, the responsible teacher, has been relieved of his duties as vice-principal and suspended from his position,’ the statement said. 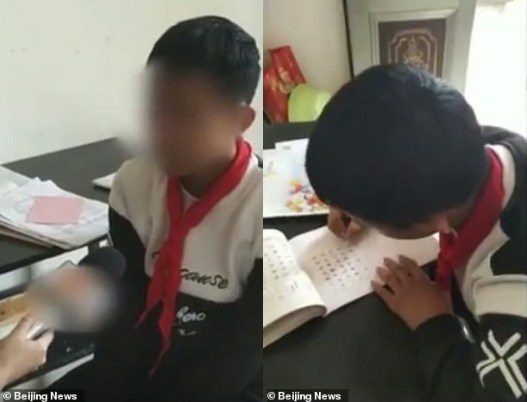 The incident sparked outrage on social media, where the hashtag ‘primary school student discriminated against after recovering from tumor’ gained more than 110 million views. Net users slammed the actions of the teacher while offering sympathy to the boy. ‘Poor boy. After going through the hardships of cancer and chemotherapy, he ended up being discriminated against. How sad must he had felt!’ another user said.